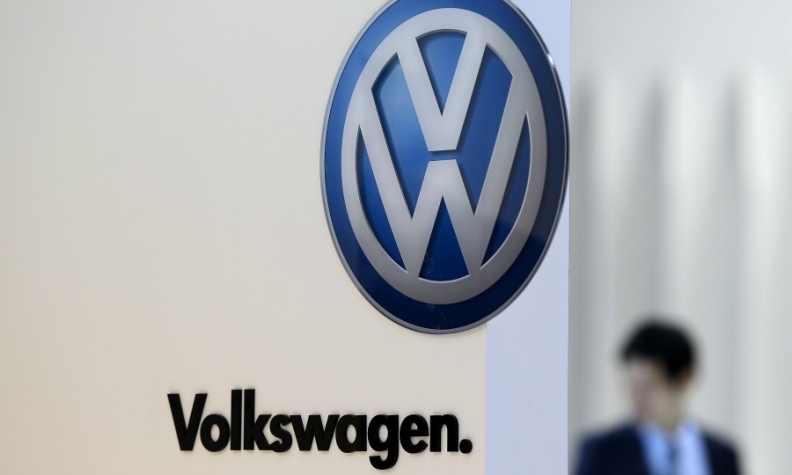 FRANKFURT -- Volkswagen Group's global vehicle sales increased just 1 percent in November to 834,800 vehicles as it was weighed down by the slumping Russian and Brazilian markets. The automaker, however, remains confident that it will meet a full-year target of 10 million deliveries. "Deliveries by the Volkswagen Group remain on track during the last few weeks of the year. The ten million mark is within reach in spite of all the uncertainties in the global automotive sector," Christian Klingler, VW Group's sales chief, said in a statement today. The November result extended 11-month group deliveries to 9.08 million vehicles, a rise of 5 percent. Last year, VW delivered 9.7 million vehicles in its 12-brand range, which includes the Porsche, Audi and Bentley upscale brands as well as the VW, Skoda and Seat volume marques. Group deliveries in western Europe through November rose 8 percent to 1.83 million, with German sales increasing 5 percent to 1.12 million. In central and eastern Europe sales were up 1 percent to 590,00, with the region’s biggest market, Russia, falling 13 percent to 240,700. In China, the carmaker’s largest-single market, 11-month sales jumped 13 percent to 3.34 million. U.S. group deliveries fell 3 percent to 542,600. In South America, sales were down 20 percent to 667,900, with a 16 percent drop to 522,000 in Brazil. All of the group's car brands increased sales in the first 11 months. The core VW brand's volume increased 2 percent to 5.59 million, while Audi's deliveries rose 10 percent to 1.59 million. Porsche sales increased 15 percent to 169,200, while Skoda deliveries climbed 12 percent to 955,300. Deliveries at Spanish unit Seat were up 11 percent to 359,400. The Volkswagen Group delivered over nine million vehicles from January to November for the first time ever this year. 9.08 (January-November 2013: 8.68; +4.6 percent)* million vehicles were handed over to customers worldwide. The company delivered 834,800 (November 2013: 828,900; +0.7 percent)* vehicles in November. "Deliveries by the Volkswagen Group remain on track during the last few weeks of the year. The ten million mark is within reach in spite of all the uncertainties in the global automotive sector", Group Board Member for Sales Christian Klingler said in Wolfsburg on Friday. Group brands delivered a total of 3.55 (3.36; +5.7 percent) million vehicles to customers on the overall European market in the period to November, of which 1.83 (1.70; +7.7 percent) million units were handed over in western Europe (excluding Germany). 1.12 (1.07; +5.0 percent) million customers took possession of a new vehicle in the home market of Germany, while the company delivered 590,900 (583,600; +1.3 percent) vehicles in central and eastern Europe. 240,700 (276,200; -12.9 percent) models were handed over to customers in Russia. The Group delivered 807,700 (807,800) vehicles in the North America region from January to November, of which 542,600 (557,000; -2.6 percent) were handed over to customers in the United States. The Volkswagen Group delivered 667,900 (831,600; -19.7 percent) vehicles in the South America region during the same period, of which 522,000 (620,000; -15.8 percent) were handed over to customers in Brazil. The Volkswagen Passenger Cars brand delivered 5.59 (5.48; +2.0 percent) million vehicles to customers worldwide from January to November. The brand continued to develop well in the Asia-Pacific region, handing over 2.72 (2.46; +10.6 percent) million units there. The brand grew deliveries on the overall European market to 1.54 (1.51; +2.4 percent) million units. The sports car manufacturer Porsche delivered a total of 169,200 (147,300; +14.9 percent) vehicles from January to November. Demand for models from the Stuttgart-based carmaker was particularly high in the Asia-Pacific region, where 54,400 (45,100; +20.5 percent) vehicles were delivered, and on the overall European market, where 54,500 (46,000; +18.3 percent) models were handed over to customers. Skoda delivered 955,300 (850,700; +12.3 percent) vehicles to customers in the eleven-month period. The Czech automaker handed over 634,900 (566,600) vehicles to customers on the overall European market, an increase of 12.1 percent. Skoda so grew deliveries in the Asia-Pacific region, where 271,100 (244,000; +11.1 percent) vehicles were handed over to customers. Seat delivered 359,400 (324,500; +10.7 percent) vehicles worldwide in the period to November. Deliveries on the overall European market increased to 302,300 (265,500; +13.9 percent) units. Seat also grew deliveries in Germany, where the company handed over 78,500 (70,900; +10.8 percent) models to customers, and in Central and Eastern Europe, where 22,700 (15,400; +47.1 percent) units were delivered. Volkswagen Commercial Vehicles handed over 401,400 (419,300;-4.3 percent) vehicles to customers from January to November, of which 297,700 (284,500; +4.6 percent) units were delivered on the overall European market. Volkswagen Commercial Vehicles also recorded growth in the Asia-Pacific region, where the company handed over 20,300 (18,800; +7.7 percent) vehicles to customers.